It was great to spend time with NSW Premier Gladys Berejiklian today, showing her around Lake Macquarie and bringing her up to speed with some of the issues we have here. We discussed issues relating to local roads, the transport interchange, the remediation site at Boolaroo among many other things, and she was very receptive to what I had to say. I also showed her around the new Toronto Police Station and introduced her to a few of the locals on a walk through Toronto. NSW Premier Gladys Berejiklian was in Toronto this afternoon where she inspected the newly opened police station and strolled through Toronto Town Square and chatted with locals. Ms Berejiklian said she’d accepted an invitation from Independent Lake Macquarie MP Greg Piper to make the visit. The Premier said she had “good discussions” with Mr Piper about things “he’s been banging on my door about for some time”. Mr Piper also accompanied the Premier on a brief tour of the area, seeing the site of the planned Lake Macquarie Transport Interchange at Glendale, the remediation works at Boolaroo, and the main road from Glendale to Toronto. Mr Piper said it was an “excellent opportunity to raise local matters directly with the Premier”. 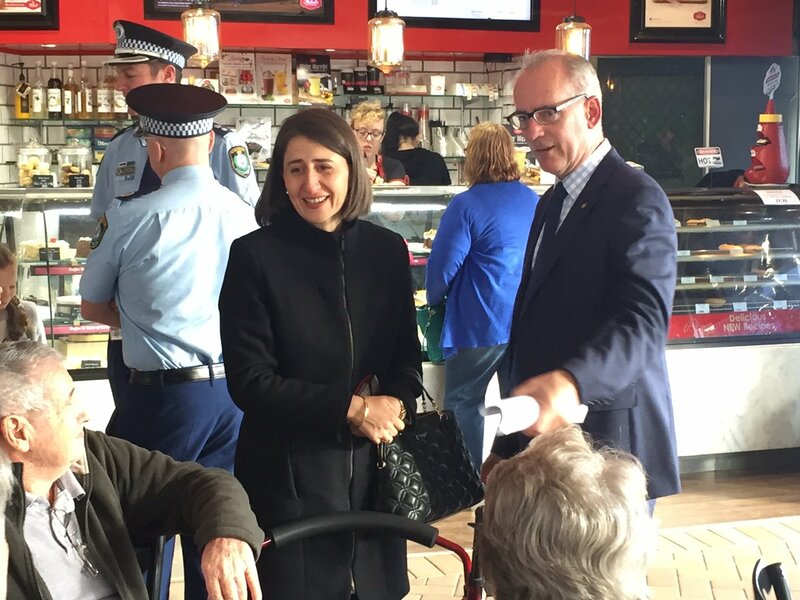 “It’s always great to have the Premier of NSW visit the electorate, but it’s also a great opportunity for me to raise and press some of those local issues that we have around the area,” he said. “We discussed local roads, particularly the Munibung Road extension at Boolaroo, and the main road between Morisset and Glendale. We also discussed the Lake Macquarie Transport Interchange project and the general need for investment in this region which, as we know, has done a lot of the heavy lifting for the state’s solid economic position. “To her credit, the Premier always listens and is very aware of what our needs are, so I’m very appreciative of her taking the time to visit this area again. Earlier in the day, Ms Berejiklian was in Newcastle to address a Hunter Business Chamber meeting. She told the meeting Newcastle’s light rail project would be delivered within budget, that the government was focused on record spending in health and education, and that “a strong Hunter – a strong Newcastle – is so vital to a strong NSW”.